"All around me I am surrounded by beauty. I see it in the trees, I see it in the sky, and I see it in the contours of the earth. Every season alters the landscape, and touches my soul in a new way. I rejoice in the passing sunlight, in its shadows and reflections. I must capture and immortalize these moments, before they fade to memory, so I may cherish them always." 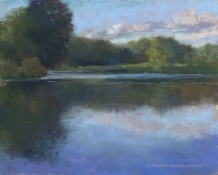 Elizabeth Rhoades is an award winning and highly recognized Connecticut artist whose pastel paintings are characterized by their vibrant color and sensitivity to the natural forms and light in the landscape. Her work depicts a knowledge and passion for the spiritual qualities of the landscape. She seeks to express her connection to, and love for, the raw beauty of our earth. Born and raised in New Haven, CT, Elizabeth currently resides in Stafford Springs, CT. She holds art degrees from SCSU, and Wesleyan University, and has obtained an advanced degree of sixth level in art education. As a very small child, Elizabeth was preoccupied with drawing and painting, earning the title of class artist throughout her childhood and teens. Her mother was an artist, and she encouraged Elizabeth to pursue her passion. Elizabeth Rhoades began her professional painting career in 1973 as a watercolorist. In the summer of 2001, during post-graduate course work in dry media, she became intrigued by the brilliant color, velvety texture, and immediacy of pastels. She paints mostly in the plein-air tradition, and in her studio in inclement weather from her value studies and reference photos that she has taken on location. Her prior mastery of watercolor painting has provided her with an intuitive knowledge of color and value, allowing her to render her motif in pastels with an impressionistic touch while quite representational. Paintings of unblemished countryside and farmland, formal gardens, and reflections on water are among her favorite subjects. Her portrayal of momentary passages of sunlight and shadow allow the viewer to experience the simple beauty of common places that would otherwise be easily overlooked. Elizabeth is represented by PS Gallery, on the Litchfield Green, Fresh Ayer Gallery in Lyme, as well as The Lyme Art Association, also in Lyme. She has also had several solo exhibits in such galleries as the Richard Storrs Library in Longmeadow, MA, Three Graces Vintage in Stafford Springs, CT, the Millhouse Gallery in Chester, CT, the Harwinton Library, the Arts Center of Tolland, and Galleria Vivace in Stafford, and she has been juried into a multitude of highly competitive exhibits throughout the United States. Elizabeth is a Signature Member of the Connecticut Pastel Society, the past President and an Elected Artist Member of the Connecticut Plein Air Painters Society, an Elected Member of the Lyme Art Association, a juried member of the Academic Artists Association, the Pastel Society of America, and Connecticut Women Artists, and a member of the Pastel Society of the West Coast, and the Pastel Society of New Mexico. Elizabeth Rhoades has painted professionally for over 40 years. Her individually commissioned pieces hang in private collections from Alaska to Maine , as well as in corporate collections. In addition to painting, Elizabeth had been an elementary art educator for thirty five years. She taught art in the towns of Avon Durham, Coventry, and Enfield, CT. Through her professional education career she has shared her skills and knowledge of art to generations of students. "Unlike the common belief that artists are born with talent and have only to find a brush to create masterworks, I believe that the artistic journey is more akin to learning a musical instrument – taking years of study and practice to master. After more than 30 years as a professional painter I am just now beginning to understand how far this journey is, and that "talent" is really the passion that allows me the necessary energy and discipline to keep painting. It is just that, the many hours of brush time, that finally results in that rare thing: A beautiful painting." Working in a variety of mediums including watercolor, oil, and pastel, Shane’s paintings are saturated with light and color, informed by many years of painting from life. Her paintings of the landscape, still life, animals and the figure reflect a solid academic training as well as the ability to communicate the energy and unique atmosphere of a scene. Shauna's work is saturated with light and color informed by many years of painting from life. Her paintings reflect a solid academic training as well as the ability to communicate the energy, color, and unique atmosphere of a scene. Selected in 2010 as Resident Artist at the New Britain Museum of American Art, Shane began her career as Resident Artist at Yellowstone National Park. Shauna has exhibited in international competitions around the country, including Oil Painters of America, Allied Artists of America, Salmagundi, and Knickerbocker Exhibits in New York City. Shauna has exhibited and received major awards in the last 7 years of Renaissance Pastel International Exhibits, and recent awards were received in the 2012 and 2013 Hudson Valley Artists Exhibit as well as the Interior and Figure in Landscape exhibits at Lyme Art Association. Juried Paint Outs include Brandywine PA, Oct. 2013, St. Petersburg, FL in 2010, and Bradenton, FL in 2012. A professional painter for more than 33 years, Shane is represented in collections in the US and around the world, including the Governor’s portrait in the State Capitol in Helena, Montana. She is a Signature Member of CT Pastel Society, an Elected Artist Member of the Lyme Art Association and CT Plein air Society. A popular demonstrator and teacher, Shauna takes pride in her ability to convey to others how to see and understand the visual world in a way that makes their artistic journey enjoyable and productive. In addition to workshops and master classes from Robert Bateman, Charles Reid, Clyde Aspevig and Raymond Everett Kinstler, her educational background includes Lyme Academy of Fine Art, University of Connecticut, and Montana State University in Bozeman, Montana.